Customizer themes design and user flow mockup by @folletto. Walkthrough of the latest patch on #37661. Eventually, as the customizer’s role grew to that of a framework for live-previewing any change to a site, it became apparent that it would benefit from a more direct way to switch themes, without entering the wp-admin context. 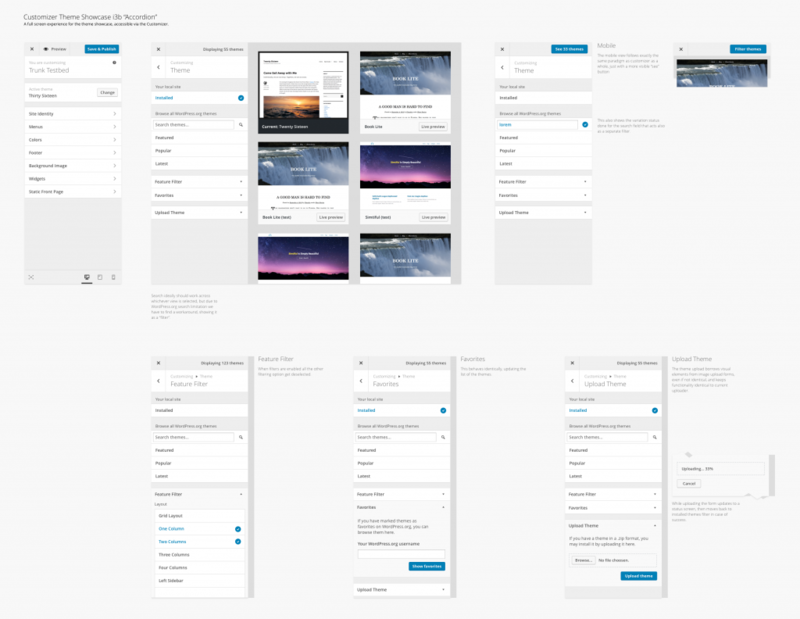 The Customizer Theme Switcher plugin was created, and after some refinement, merged into WordPress 4.2. However, while it initially included external links to install themes in the admin, these were eventually removed due to the jarring experience of unexpectedly leaving the customizer. Currently, there is no indication that additional themes can be installed when viewing available themes in the customizer. For new users, it may take quite a bit of time to discover the ability to install themes, via wp-admin, or they may give up on WordPress before making this discovery. This is a usability dead-end where a user’s flow is disrupted in the process of discovering, installing, previewing, and activating themes, both on initial site setup and when considering a redesign. When the theme switcher plugin was developed, the team made preliminary plans for a theme installation interface as a second phase of the project. Specifically, it would leave the “preview” context of the customizer but retain the same identity in the user experience. @folletto helped develop this initial concept in early 2015. One of the biggest challenges with theme installation in wp-admin, and opportunities in the customizer, is previewing themes. Currently, a customizer-like frame displays a preview hosted on WordPress.org, with limited content. Rather than opening this potentially-disorienting similar but different interface, the proposed flow de-emphasizes the distinction between installed and available themes. The primary action for available themes is now “Install & Preview”, which installs the theme and live previews it in one step. Users can now see any theme on their site with their content and play with its options in the customizer in one click. If they decide it’s the wrong theme for their site, the themes panel can be quickly reopened and another theme selected and previewed with no harm done. A secondary action allows themes to be installed without instantly previewing, so that the installed themes tab can become a personal theme library of sorts, where users can save themes that they might want to try on their site. Installed themes being a filter along with the available theme headings unifies the previously-disorienting separation of themes and add-new themes on separate screens, with confusingly-separate search and header (add new/upload theme) functionality. Due to the tight integration with the existing system, with the existing theme control and section as well as internal elements in the customizer manager and theme details template requiring moderate modifications, this project was implemented as a patch and cannot be reasonably converted into a plugin and back. The patch has been available on trac for six+ weeks, with iterations continuing to improve and polish the new experience. The technical implementation continues adapting the concepts present in the backbone.js-based themes experience in wp-admin to leverage the customizer API. With the themes experience natively built on the customizer framework, it should be much easier for developers to improve and maintain the core experience in the future as well as extending the core experience in a structured way. Installed themes are no longer loaded every time the customizer is opened, resulting in potentially significant performance improvements by only calling wp_prepare_themes_for_js() when needed. This also allows themes in the customizer to be fully disabled with remove_panel( 'themes' ). The themes experience is unchanged on the top level of the customizer, but selecting the change theme button now opens a panel that fills the entire screen, as the preview is not relevant when considering a theme change. The UI diverges somewhat from what is found in the theme installer in wp-admin (which will remain), particularly around the filters. The theme details view is unified between installed and available themes; clicking on a screenshot opens the details view to match the admin UI. Primary buttons are used where clicking them takes you away from the current page (ie, for previews); secondary buttons are used elsewhere. The loading strategy attempts to balance performance with wait time by loading theme data from Ajax in large batches (100 themes) and following up by rendering screenshots as they become visible (as the existing interface does). Four usability tests have been conducted so far. The full test screencasts are available on Make/Design, alongside key takeaways. These tests expose a lot of largely-known issues with themes and the customizer in general, but did not reveal any significant issues with the proposed new theme browser. Because the tests were conducted in-person with a limited set of volunteers, additional testing with a broader user base would be ideal. There has been design feedback since the user testing was conducted, resulting in some significant changes. @karmatosed has volunteered to coordinate additional testing in the next week to verify that the changes haven’t introduced usability regressions, and to test with a broader audience. Check out the call for user testing on make/design to help out here. A visual record on a phone of the revised design has been posted on make/flow. Because the new interface is built entirely on the customizer API, third-party plugins should now be able to integrate much more easily. This means that other theme marketplaces (including commercial themes) could realistically be browsed (and maybe even installed) from within WordPress, while leveraging the core UI exactly. The presentational flexibility is available via the customizer API (with custom theme sections for other theme sources, and theme controls for individual themes), but there are likely some gaps in the ability to do this seamlessly in the internals. If anyone is interested in building this sort of functionality, please evaluate whether any additional hooks are needed so that they can launch alongside the new feature. Design/UX review – tentative approval has been provided from @karmatosed and @folletto (with additional input from others in last week’s design meeting) with an expectation that minor adjustments will continue to be required. General design feedback is still welcome, but major changes are unlikely to be feasible at this point. Accessibility review – @afercia completed an initial review, with the issues fixed in a subsequent patch. A comprehensive final review would be a good idea as well, since there have been significant design changes. Code review – to be handled by @westonruter once the patch is otherwise deemed “ready” based on review from other teams. To test, update to latest trunk and apply the latest patch on #37661. On your test site, open the customizer and “change” the theme. Try out the various filters, browse themes, and install and preview them. Also test the inline update and deletion functionality. To meet the feature merge deadline for 4.7 (10/19), reviews from various teams and any corresponding iterations need to be completed by October 12th, leaving a week for final code review and commit. General feedback and specific reviews and action items should be provided as comments on this post. Update: this feature was merged in 4.9. We’ve made lots of progress in the past week and will be holding another meeting tomorrow, Tuesday February 3 2015 16:00 UTC, in #core-customize Slack. The accessibility team did an extensive review and we’ve addressed nearly all of the issues that can be fixed in the plugin (big props to @afercia especially for reviewing and patching some of the issues). I made several core tickets (some with patches, some good-first-bugs) for some of the other issues that came up during the review. @designsimply and @vizkr have been working on formal and informal user tests as well. It’s been a little tricky to try to nudge users in the direction of the Theme Switcher in the Customizer without explicitly asking them to change the theme, but they haven’t had any negative feedback or expressed that having themes in the Customizer felt at all out of place. We’ve made a couple of minor adjustments both to the plugin (improving the filter to search for tags without hyphens) and the prompts, and additional tests are in-progress. We’d like to encourage anyone that can to do informal in-person testing, asking for feedback on the workflows and/or comparing the themes admin screen to themes in the Customizer. Our biggest remaining decision is whether to change the title of the “themes” section in the Customizer. Currently, it’s “Theme: Current Theme”. Open to suggestions here; we’ll tweak it for screen readers regardless if it works for everyone else as-is, but I’m not convinced that it’s the most discoverable option currently.